We all know how important it is to have a presence on social media platforms. We&apos;ve compiled some suggested posts for Facebook and Twitter that you may use to promote your meeting and build attendance. We even created a gallery of images that you can download to complement your posts. 1. 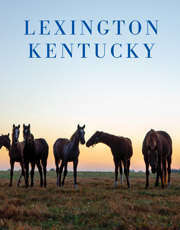 There are about 150 horse farms in Lexington. Which one are you visiting during #insertgrouphashtag #sharethelex Link to: bit.ly/2oAMozI Suggested image: 115-3-19380 Horse gazing through fence. 2. On horseback or on foot, explore the Kentucky Horse Park during #insertgrouphashtag #sharethelex Link to: bit.ly/2oHZyGU Suggested image: 115-3-20368 Woman with red jacket on, riding a horse. 1. When it comes to local beer, Lexington crafts the best. Plan your first brew stop after #insertgrouphashtag #sharethelex Link to: bit.ly/2o7zFnq Suggested image: 115-3-1805 Woman in blue shirt pouring beer. 1. Eat like a local during #insertgrouphashtag Flag this dining guide to find your favorite #sharethelex Link to: bit.ly/2J3krs3 Suggested image: 115-3-20256 Table of food. 2. The Distillery District is where it&apos;s at! Located right downtown, grab a drink or a bite, or both after #insertgrouphashtag. #sharethelex Suggested image: 115-3-17986 People sitting at picnic table, dining. 2. Lexington, KY was one of the largest and wealthiest towns west of the Alleghenies by 1820. Experience some of that with a stroll back in time in Gratz Park, Lexington&apos;s poshest neighborhood of the early 1800s; still a scenic and charming place to live. Suggested image: 115-3-17002 Pink and blue house. 3. Hey #insertgrouphashtag visit the home of The Great Compromiser, Henry Clay. #sharethelex Link to: bit.ly/2ppnOBN Suggested photo: 115-3-19997 Large brick house with lawn in forground. 3. Hey #insertgrouphashtag if you like challenges, you should attempt the mural challenge. #sharethelex Link to: bit.ly/2plorug Suggested photo: 115-3-19620 Abe Lincoln mural. 1. Lexington, KY knows Bluegrass music! Use this guide and catch a performance during #insertgrouphashtag #sharethelex Link to: bit.ly/2oPAVJn Suggested photo: 115-3-17239 3-piece band on stage. 2. Lexington and live music go hand-in-hand. Find a spot to go to during #insertgrouphashtag#sharethelex Link to: bit.ly/2q9Sm8m Suggested photo: 115-3-12374 Music at the Lexington Opera House. 3. Celebrate Americana music during #insertgrouphashtag with an internationally live-taped show #WoodSongs #sharethelex Link to: bit.ly/2pDDFxI Suggested photo: 115-3-12481 Man on stage with guitar. 3. During # insertgrouphashtag take part in some retail therapy on Clay Ave. #sharethelex Link to: bit.ly/2oQs2z4 Suggested photo: 115-3-11003 Girl looking through clothes. 2. Lexington, KY is a member of The Meetings and Conventions Magazine Hall of Fame for Gold Service Awards and for good reason. The city&apos;s hospitality is unmatchable and they are ready for (insert meeting name).